A camcorder is a portable consumer electronics device for recording video and audio using a built-in recorder unit. It contains both a video camera and a video recorder in one unit, hence its compound name. The earliest camcorders employed analog recording onto videotape. Since the 1990s, digital recording has become the norm, but tape remained the primary recording media. Starting from early 2000s, tape as storage media is being gradually replaced with tapeless solutions like optical disks, hard disk drives, and flash memory. All tape-based camcorders have removable media in the form of video cassettes. Solid-state camcorders can have either removable media in the form of memory cards, or built-in memory, or both. HDD-based camcorders usually have non-removable media in the form of a hard disk drive (HDD). Camcorders that do not use magnetic tape are often called tapeless camcorders. Camcorders that use two different types of media, like built-in HDD and memory card, are often called hybrid camcorders. Video cameras were originally designed for broadcasting television images. Cameras found in television broadcast centers were extremely large, mounted on special trolleys, and wired to remote recorders located in separate rooms. As technology advanced, miniaturization eventually enabled the construction of portable video-cameras and portable video-recorders. Prior to the introduction of the camcorder, portable video-recording required two separate devices: A video-camera and a VCR. Specialized models were introduced by both JVC (VHS) and Sony (Umatic & Betamax) to be used for mobile work. The portable VCR consisted of the cassette player/recorder unit, and a television tuner unit. The cassette unit could be detached and carried with the user for video recording. While the camera itself could be quite compact, the fact that a separate VCR had to be carried generally made on-location shooting a two-man job, however the advent of these portable VCRs helped to eliminate the phrase "film at eleven." Rather than wait for the lengthy process of film developing, portable VCRs and video cameras allowed video to be shown during the 6 o'clock news. In 1982, two events happened that eventually led to the home camcorder boom: JVC introduced the VHS-C format, and Sony released the first professional camcorder named Betacam. VHS-C was essentially VHS with a reduced-size cassette that had been designed for portable VCRs. Sony's Betacam was a standard developed for professional camcorders, which used component video to provide a superior picture. At first, cameramen did not welcome Betacam, because before it, carrying and operating the VCR unit was the work of a video engineer; after Betacam they came to be required to operate both video camera and VCR. However the cable between cameramen and video engineers was eliminated, the freedom of cameramen improved dramatically and Betacam quickly became the standard for both news-gathering and in-studio video editing. In 1983, Sony released the Betamax-based Betamovie BMC-100P, the first consumer camcorder. A novel technique in the BMC-100P was used to reduce the size of the spinning video head drum, which was then used for many subsequent camcorders. Nevertheless, the unit could not be held with one hand and was typically resting on a shoulder. Some later camcorders were even larger, because the Betamovie models had only optical viewfinders and no playback or rewind capability. Most camcorders were and still are designed for right-handed operation, though a few possessed ambidextrous ergonomics. That same year JVC released its own camcorder using its pre-existing VHS-C format. The VHS-C cassette held enough tape to record 40 or 120 minutes of VHS video, while a mechanical adapter enabled playback of VHS-C videocassettes in home VCRs. In the meantime, Sony was busy redesigning its Betamax system to create the new Video8 standard, released in 1985. Video8 eliminated the problem of short running time, by using an all-new metal composition video cassette whose 8mm tape width is 33 percent less than VHS/Betamax tape (~12.7 mm), allowing even further miniaturization in the recorder's tape-transport assembly and cassette media. Both VHS-C and 8 mm video represented a trade-off for the consumer. Although the Video8 and Hi8 camcorders produced quality equal to VHS-C and Super VHS-C camcorders (250/420 lines horizontal), the standard 8 mm cassette had the advantage with up to two hours length (four hours in slow mode). On the down side, since the 8 mm format was incompatible with VHS, 8 mm recordings could not be played in consumers' VHS VCRs. Equally important entry-level VHS-C camcorders were priced less than 8 mm units, and thus neither "won" the war. It became a stalemate. (Side note: In 1985, Panasonic, RCA, and Hitachi began releasing full-sized VHS camcorders, which offered up to 2 hours of record time, and thus found a niche with videophiles, industrial videographers, and college TV studios.) S-VHS full-sized camcorders were later released in 1987. In the mid-1990s, the camcorder reached the digital era with the introduction of DV and miniDV. Its cassette media was even smaller than 8 mm media, allowing another size reduction of the tape transport assembly. The digital nature of miniDV also improved audio and video quality over the best of the analog consumer camcorders (SVHS-C, Hi8), although some users still prefer the analog nature of Hi8 and Super VHS-C, since neither of these produce the "background blur" or "mosquito noise" of Digital compression. Variations on the DV camcorder include the Digital8 camcorder and the MPEG2-based DVD camcorder. The evolution of the camcorder has seen the growth of the camcorder market as price reductions and size reductions make the technology more accessible to a wider audience. When camcorders were first introduced, they were bulky shoulder-operated luggables that cost over $1,500 US dollars. As of 2008, an entry-level camcorder fits in the palm of a hand and is sold at a retail price of approximately 100 U.S. dollars. Camcorders contain 3 major components: Lens, imager, and recorder. The lens gathers and focuses light on the imager. The imager (usually a CCD or CMOS sensor on modern camcorders; earlier examples often used vidicon tubes) converts incident light into an electrical signal. Finally, the recorder converts the electric signal into digital video and encodes it into a storable form. More commonly, the optics and imager are referred to as the camera section. In consumer units, the above adjustments are often automatically controlled by the camcorder's electronics, but can be adjusted manually if desired. Professional units offer direct user control of all major optical functions. The imager converts light into electric signal. The camera lens projects an image onto the imager surface, exposing the photosensitive array to light. The light exposure is converted into electrical charge. At the end of the timed exposure, the imager converts the accumulated charge into a continuous analog voltage at the imager's output terminals. After scan-out is complete, the photosites are reset to start the exposure-process for the next video frame. With the first (digital) camcorders, an analog-to-digital (ADC) converter digitized the imager (analog) waveform output into a discrete digital-video signal. The imager in these cameras was a CCD which was analogue by nature. Modern cameras will generally have a CMOS chip in place of a CCD as a CMOS is completely digital in nature and there is no analogue voltage signal to digitize because the light is sampled directly by each pixel and converted to a binary digital signal per each pixel. CCD chips will generally see better in low light conditions because of the CCD's nature of capturing more light in the infrared range, but will severely lack in the human visibility spectrum, thus sacrificing color, on the other hand CMOS imagers do not have great low light capability but will capture the visible spectrum better and thus displaying color properly. The third section, the recorder, is responsible for writing the video-signal onto a recording medium (such as magnetic videotape.) The record function involves many signal-processing steps, and historically, the recording-process introduced some distortion and noise into the stored video, such that playback of the stored-signal may not retain the same characteristics/detail as the live video feed. All but the most primitive camcorders imaginable also need to have a recorder-controlling section which allows the user to control the camcorder, switch the recorder into playback mode for reviewing the recorded footage and an image control section which controls exposure, focus and white-balance. The image recorded need not be limited to what appeared in the viewfinder. For documentation of events, such as used by police, the field of view overlays such things as the time and date of the recording along the top and bottom of the image. Such things as the police car or constable to which the recorder has been allotted may also appear; also the speed of the car at the time of recording. Compass direction at time of recording and geographical coordinates may also be possible. These are not kept to world-standard fields; "month/day/year" may be seen, as well as "day/month/year," besides the ISO standard "year-month-day." And the Danish police have the speed of the police car in the units "km/t" sic (time being Danish for "hour"). Camcorders are often classified by their storage device: VHS, Betamax, Video8 are examples of older, videotape-based camcorders which record video in analog form. Newer camcorders include Digital8, miniDV, DVD, Hard drive, and solid-state (flash) semiconductor memory, which all record video in digital form. In older digital camcorders, the imager-chip, the CCD was considered an analog component, so the digital namesake is in reference to the camcorder's processing and recording of the video. Many next generation camcorders use a CMOS imager, which register photons as binary data as soon as the photons hit the imager and thus tightly marrying part 2 and 3. It should be noted that the take up of digital video storage in camcorders was an enormous milestone. MiniDV storage allows full resolution video (720x576 for PAL,720x480 for NTSC), unlike previous analogue video standards. Digital video doesn't experience color bleeding, jitter, or fade, although some users still prefer the analog nature of Hi8 and Super VHS-C, since neither of these produce the "background blur" or "mosquito noise" of Digital compression. In many cases, a high-quality analog recording shows more detail (such as rough textures on a wall) than a compressed digital recording (which would show the same wall as flat and featureless). Although, the low resolution of analogue camcorders may negate any such benefits. The highest-quality digital formats, such as Digital Betacam and DVCPRO HD, have the advantage over analog of suffering little generation loss in recording, dubbing, and editing (MPEG-2 and MPEG-4 do suffer from generation loss in the editing process only). Whereas noise and bandwidth problems relating to cables, amplifiers, and mixers can greatly affect analog recordings, such problems are minimal in digital formats using digital connections (generally IEEE 1394, SDI/SDTI, or HDMI). Although both analog and digital can suffer from archival problems, digital is more prone to complete loss. Theoretically, digital information can be stored indefinitely with zero deterioration on a digital storage device (such as a hard drive), however since some digital formats (like miniDV) often squeeze tracks only ~10 micrometers apart (versus ~500 μm for VHS), a digital recording is more vulnerable to wrinkles or stretches in the tape that could permanently erase several scenes worth of digital data, but the additions tracking and error correction code on the tape will generally compensate for most defects. On analog media similar damage barely registers as "noise" in the video, still leaving a deteriorated but watchable video. The only limitation is that this video has to be played on a completely analogue viewing system, otherwise the tape will not display any video due to the damage and sync problems. Even digital recordings on DVD are known to suffer from DVD rot that permanently erase huge chunks of data. Thus the one advantage analog seems to have in this respect is that an analog recording may be "usable" even after the media it is stored on has suffered severe deterioration whereas it has been noticed that even slight media degradation in digital recordings may cause them to suffer from an "all or nothing" failure, that is, the digital recording will end up being totally un-playable without very expensive restoration work. Most other digital consumer camcorders record in DV or HDV format on tape and transfer content over FireWire (some also use USB 2.0) to a computer, where the huge files (for DV, 1GB for 4 to 4.6 minutes in PAL/NTSC resolutions) can be edited, converted, and (with many camcorders) also recorded back to tape. The transfer is done in real time, so the complete transfer of a 60 minute tape needs one hour to transfer and about 13GB disk space for the raw footage only - excluding any space needed for render files, and other media. Time spent in post-production (editing) to select and cut the best shots varies from instantaneous "magic" movies to hours of tedious selection, arrangement and rendering. As the mainstream consumer market favors ease of use, portability, and price, consumer camcorders emphasize these features more than raw technical performance. For example, good low-light capabilities require large capturing chips, which affects price and size. Thus, consumer camcorders are often unable to shoot useful footage in dim light (though some units, particularly single-chip units by Sony, offer night vision capability) which utilizes the infrared sensitivity of the CCD imager, though this sacrifices color in well lit recording. Manual controls need space, either in menus or as buttons and make the use more complicated, which goes against the requirement of ease of use. Consumer units offer a plethora of I/O options (IEEE 1394/Firewire, USB 2.0, Composite and S-Video), but lack many manual settings, often excluding video exposure, gain control, or sound level management. For the beginner, entry-level camcorders offer basic recording and playback capability. For the sophisticated hobbyist, high-end units offer improved optical and video performance through multi-CCD or multi-CMOS components and name-brand optics, manual control of camera exposure, removable optics, and more, but even consumer camcorders which are sold for $1000 such as the Panasonic GS250 are not well-suited for recording in dim light. When dimly-lit areas are brightened in-camera or in post-production, considerable noise distracts the viewer. Commercial special noise reduction algorithms are available to fix this as those available from Neat Image\Neat Video. Before the twenty-first century, consumer video editing was a difficult task requiring a minimum of two recorders. Now, however, a contemporary Personal Computer of even modest power can perform digital video editing with editing software. Many consumer camcorders bundle a light (feature-limited) version of such software, as do some computers, and more advanced software is widely available at a variety of price points. As of 2007, analog camcorders are still available but not widely marketed anymore; those that are still available are often less than US$250, but require special capture hardware for non-linear editing which may run into the thousands of dollars due to the plethora of sync and signal problems that may not be resolved with cheap capture equipment. In terms of sales, miniDV camcorders (and to a much lesser extent, Digital8) dominate most first world markets. Camcorders which record directly on DVD media are also on the rise, primarily among users with no plans to edit their footage. Nonetheless, software for editing video files created by DVD camcorders is available, including Womble DVD and VideoRedo. A user may also choose to recode the transport files of a DVD to that of an MPEG2 file which is supported by many other editing suites. Hard disk based camcorders are appearing as well; JVC and Sony are the primary manufacturers of these units. Increased storage capacity over other types of media is the main advantage with these models; however, with this follows a slightly reduced image quality and loss of flexibility when compared to other formats such as MiniDV, making the ease of transferring the footage to a PC for quick editing the main attraction of Hard disk camcorders. Another downside Hard Drive based camcorders is the recording device itself which can be damaged irreparably by power failure or physical shock to the unit. Video-capture capability is now available in selected models of cellphones, digicams, and other portable consumer electronic devices such as media players. Typically only digital cameras offer videos that are of useful quality for anything other than a novelty. The marketing approach is to claim 320 X 240 video is "VHS quality," and 640 X 480 video is "DVD quality." A few cameras can offer 800 X 600 resolution, and a recent development is High Definition (720p) in cameras such as the Sanyo Xacti HD1. All are limited somewhat by having to serve as both cameras and camcorders. Compared to a dedicated camcorder they have poor low light performance, limited options, and many do not offer zoom during filming. (This is because the noise from the zooming motor is heard on the clip, only a few digicams have a manual zoom). Many either have fixed focus lenses, or autofocus lenses that are sluggish and noisy compared to a camcorder. The quality varies widely depending on the compression format used and the type of device. Frame rates can range from 30 frame/s down to 10 frame/s, or can be variable, slowing down in dark settings. The length of clips can also vary from "unlimited" (up to the capacity of the storage media) down to as little as 30 seconds. Low end MPEG-4 camcorders can often record unlimited length video clips at 320 X 240, but the quality is far below even a VHS-C camcorder. In addition, MPEG-4 is currently not widely supported in many video editing programs. The use of digicams for recording video clips is limited mainly to circumstances where quality is not an issue. This is gradually being offset by the greater sophistication of the cameras, the increasing storage capacity of flash cards and microdrives, and the desire of consumers to carry only a single device. Camcorders have found use in nearly all corners of electronic media, from electronic news organizations to TV/current-affairs productions. In locations away from a distribution infrastructure, camcorders are invaluable for initial video acquisition. Subsequently, the video is transmitted electronically to a studio/production center for broadcast. Scheduled events such as official press conferences, where a video infrastructure is readily available or can be feasibly deployed in advance, are still covered by studio-type video cameras (tethered to "production trucks"). 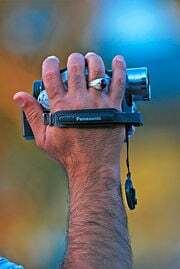 For casual use, camcorders often cover weddings, birthdays, graduation ceremonies, Kids growing up, and other personal events. The rise of the consumer camcorder in the mid to late '80s led to the creation of shows such as the long-running America's Funniest Home Videos, where people could showcase homemade video footage. Political protestors who have capitalized on the value of media coverage use camcorders to film things they believe to be unjust. Animal rights protesters who break into factory farms and animal testing labs use camcorders to film the conditions the animals are living in. Anti-hunting protesters film fox hunts. Tax protesters provide live coverage of anti-tax demonstrations and protests. Anti-globalization protesters film the police to deter police brutality. If the police do use violence there will be evidence on video. Activist videos often appear on Indymedia. The police use camcorders to film riots, protests and the crowds at sporting events. The film can be used to spot and pick out troublemakers, who can then be prosecuted in court. 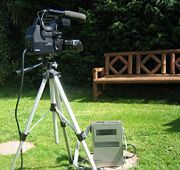 Camcorders are often used in the production of low-budget TV shows where the production crew does not have access to more expensive equipment. There are even examples of movies shot entirely on consumer camcorder equipment (see Blair Witch Project and 28 Days Later). In addition, many academic filmmaking programs have switched from 16mm film to digital video, due to the vastly reduced expense and ease of editing of the digital medium as well as the increasing scarcity of film stock and equipment. Some camcorder manufacturers cater to this market, particularly Canon and Panasonic, who both support "24p" (24 frame/s, progressive scan; same frame rate as standard cinema film) video in some of their high-end models for easy film conversion. Even high-budget cinema is done using camcorders in some cases; George Lucas used Sony CineAlta camcorders in two of his three Star Wars prequel movies. This process is referred to as digital cinematography. BCE (1954): First tape storage for video, manufactured by Bing Crosby Entertainment from Ampex equipment. BCE Coloer (1955): First color tape storage for video, manufactured by Bing Crosby Entertainment from Ampex equipment. Simplex (1955): Developed commercially by RCA and used to record several live broadcasts by NBC. Quadruplex (1955): Developed formally by Ampex, and this became the recording standard for the next 20 years. Vera (1955): An experimental recording standard developed by the BBC, but was never used or sold commercially. Umatic (1971): The initial tape used by Sony to record video. Umatics (1974): A small sized version of Umatic used for portable recorders. Betamax (1975): Only used on very old Sony and Sanyo camcorders and portables; obsolete by the mid/late-80s in the consumer market. Type B (1976): Co-developed by Sony and Ampex and this became the broadcast standard in Europe for most of the 1980s. Type C (1976): Co-developed by Sony and Ampex. VHS (1976): Compatible with VHS standard VCRs, though VHS camcorders are no longer made. VHS-C (1982): Originally designed for portable VCRs, this standard was later adapted for use in compact consumer camcorders; identical in quality to VHS; plays in standard home VCRs. Still available in the low-end consumer market (JVC model GR-AXM18 is VHS-C; see page 19 of the owner's manual}. Relatively short running time compared to other formats. Betacam (1982): Introduced by Sony as a 1\2 inch tape for professional video recorders. Video8 (1985): Small-format tape developed by Sony to combat VHS-C's compact palm-sized design; equivalent to VHS or Betamax in picture quality, but not compatible. High quality audio as standard. Obsolete. Hi-Vision (1985): MUSE renamed Hi-Vision and players started appearing on the market that could playback 1080i analogue video. Laserdisk (1978): Marketed originally as LaserVision. Umatic BVU (1982): Largely used in high-end consumer and professional equipment. The introduction of Umatic BVU spelled the end of 16mm film recordings. Umatic BVU-SP (1985): Largely used in high-end consumer and professional equipment. The introduction of Umatic BVU spelled the end of 16mm film recordings. Betacam-SP (1986): An minor upgrade to the Betacam format, but because of the upgrade, it became a broadcast standard. S-VHS (1987): Largely used in medium-end consumer and prosumer equipment; rare among mainstream consumer equipment, and rendered obsolete by digital gear like DigiBetacam and DV. S-VHS-C (1987): An upgrade to provide near-laserdisc quality. Now limited to the low-end consumer market (example: JVC SXM38). As per VHS-C, relatively short running time compared to other formats. W-VHS (1994): Short lived 1080i tape format that had the ability to record. Umatic (1982): An experiments overhaul was made to umatic to record digital video, but this was impractical and the tapes were used as a transport for digital audio only. This led to the D series of tapes about 4 years later. D1 (Sony) (1986): The first digital video recorder. It used digitized component video, encoded at Y'CbCr 4:2:2 using the CCIR 601 raster form and experimentally supported full HD broadcasts. D2 (video format) (1988): This was a cheap alternative the D1 tape created by Ampex and this actually encoded video digitally instead of sampling composite video and experimentally supported full HD broadcasts. D3 (1991): Created by Panasonic to compete with the Ampex D2 and experimentally supported full HD broadcasts. DCT (videocassette format) (1992): This was the first compressed video tape format created by Ampex based on the D1 format. It used discrete cosine transform as its codec of choice. DST was a data-only standard introduced to the rapidly growing IT industry. D5 HD (1994): 1080i digital standard introduced by Sony based on the D1 tape. Editcam (1995): First drive recording standard introduced by Ikegami. FieldPak used a IDE hard and RAMPak used a set of flash ram modules. It can record in DV25, Avid JFIF, DV, MPEG IMX, DVCPRO50, and Avid DNxHD format, depending on generation. Digital-s (1995): JVC debuted a digital tape similar to VHS but had a different tape inside and supported digital HD broadcasts. Widely used by FOX broadcasting. Also called D-9. 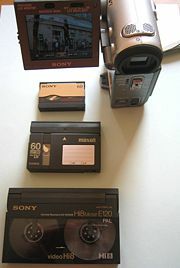 MiniDV (1995) was a smaller version of the DV standard released by Sony. DVD (1995): Uses either Mini DVD-R or DVD-RAM. This is a multi-manufacturer standard that uses 8 cm DVD discs for 30 minutes of video. DVD-R can be played on consumer DVD players but cannot be added to or recorded over once finalized for viewing. DVD-RAM can be added to and/or recorded over, but cannot be played on many consumer DVD players, and costs a lot more than other types of DVD recordable media. The DVD-RW is another option allowing the user to re-record, but only records sequentially and must be finalized for viewing. The discs do cost more than the DVD-R format, which only records once. DVD discs are also very vulnerable to scratches. DVD camcorders are generally not designed to connect to computers for editing purposes, though some high-end DVD units do record surround sound, a feature not standard with DV equipment. DV (1996): Sony debuted the DV format tape with DVCAM being professional and DVCPRO being a Panasonic variant. D-VHS (1998): JVC debuted the digital standard of VHS tape and which supported 1080p HD. Many units also supported IEEE1394 recording. Digital8 (1999), that uses Hi8 tapes (Sony is the only company currently producing D8 camcorders, though Hitachi used to). Most (but not quite all) models of Digital 8 cameras have the ability to read older Video8 and Hi8 analog format tapes. The format's technical specifications are of the same quality as MiniDV (both use the same DV codec), and although no professional-level Digital8 equipment exists, D8 has been used to make TV and movie productions (example: Hall of Mirrors). MICROMV (2001): Uses a matchbox-sized cassette. Sony was the only electronics manufacturer for this format, and editing software was proprietary to Sony and only available on Microsoft Windows; however, open source programmers did manage to create capture software for Linux. The hardware is no longer in production, though tapes are still available through Sony. XDCAM (2003): A professional blu-ray standard introduced by Sony. This is similar to that of regular BRD but used different codecs, namely MPEG IMX, DV25 (DVCAM), MPEG-4, MPEG-2, and HD422. Blu ray Disc (2003): Presently, Hitachi is the only manufacturer of Blu-ray Disc camcorders. P2 (2004): First solid state recording medium of professional quality, introduced by Panasonic. Recorded DVCPRO, DVCPRO50, DVCPRO-HD, or AVC-Intra stream onto the card. HDV (2004): Records up to an hour of HDTV MPEG-2 signal roughly equal to broadcast quality HD on a standard MiniDV cassette. SxS (2007): Jointly developed by Sony and Sandisk. This is a solid state format of XDCAM and is known as XDCAM EX. MPEG-2 codec based format, which records MPEG-2 program stream or MPEG-2 transport stream to various kinds of tapeless media (hard disks, solid-state memory, etc). Used both for standard definition (JVC, Panasonic) and high definition (JVC) recording. H.264 codec based (and derivative AVCHD) format, which records MPEG-4 AVC (H.264) compressed video to various kinds of tapeless media (recordable optical discs, flash memory, hard disks, etc). Used mostly for high definition recording (Sony, Panasonic, Canon). Since most manufacturers focus their support on Windows and Mac users, users of other operating systems often are unable to receive support for these devices. However, open source products such as Cinelerra and Kino (written for the Linux operating system) do allow full editing of some digital formats on alternative operating systems, and software to edit DV streams in particular is available on most platforms. Many low-end tapeless camcorders, however, do not support any operating system but Windows, requiring either third-party software or a switch to a more standardized format such as DV. ↑ 1.0 1.1 Total Rewind, Separate camera and recorder; First VHS-C camcorder. Retrieved February 14, 2009. Davidson, Homer L. 1996. Troubleshooting and Repairing Camcorders. New York, NY: McGraw-Hill. ISBN 9780070157606. Desposito, Joe. 1998. Complete Camcorder Troubleshooting & Repair. Indianapolis, IN: Prompt Publications. ISBN 0790611058. McComb, Gordon, and Andy Rathbone. 1995. VCRs & Camcorders for Dummies. Foster City, CA: IDG Books Worldwide. ISBN 1568843976. How Camcorders Work from HowStuffWorks. This page was last modified on 6 January 2017, at 23:03.